Living a Fit and Full Life: Netflix Original Beat Bugs Toys are Here! The Beat Bugs Toys have arrived! My kids are so in love with these Beat Bug items! With back to school in full affect the new Beat Bugs® 16" Kids' Backpack with Music and Thermos® FUNtainer® Vacuum Insulated Stainless Steel BottleBeat Bugs will surely come in handy. 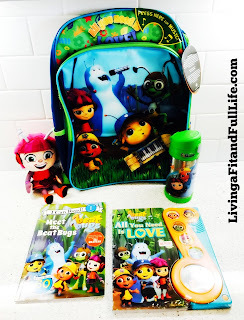 My kids love that the backpack plays music when the button is pushed and how decked out it is with their favorite Beat Bugs characters. The Thermos is adorable and seems very well made and could possibly survive the whole school year! My 4 year old is in love with the little Kumi plush and has been sleeping with it every night since receiving it. It's super soft and oh so adorable. My 7 year old loves the I Can Read Meet the Beat Bugs book and has been reading it to her little sister which is incredibly sweet and a terrific way for her to practice her reading. The LITTLE MUSIC NOTE 6 BUTTON book is probably my 2 year old's favorite book. He loves that it plays music from the Netflix Original Beat Bugs Show. If you have little ones who are fans of the Netflix Original Beat Bugs show they will surely love these toys. They make terrific gifts and are incredibly fun for kids! Get hooked on the Netflix Original Beat Bugs Series this summer! My kids have been having a blast watching the Netflix Original Beat Bugs Series and I have to admit that even I tend to end up watching the show when I'm supposed to be cleaning or folding laundry. As a mom I love that the Beat Bugs introduces a new generation to the music of The Beatles! While The Beatles might be from my parents generation I tend to recognize their music and even know most of the words to the songs. I'm so glad that now will kids will be able to do the same. The Netflix Original Beat Bugs Series is an absolute blast to watch and my kids love the guest stars and characters on the show. The adventures are incredibly fun and extremely entertaining. I love to see my kids enjoying the music and the show! The Netflix Original Beat Bugs Series is the perfect way to keep kids entertained! Click Here to see the all the Beat Bugs toys! 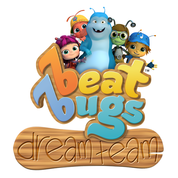 Click HERE to learn more about the Beat Bugs! Follow the Beat Bugs on social media!